Wimbotsham is a small parish in the west of the county close to the town of Downham Market. Wimbotsham derives from the Old English meaning ‘homestead of a man named Winebald’. The earliest archaeological find from the parish is a Neolithic polished flint axehead (NHER 17984) that was found near a dyke in 1982. Other Neolithic and Bronze Age flints (NHER 30810) have also been found. A ring ditch (NHER 16540), probably the remains of a Bronze Age barrow, is visible as a cropmark on aerial photographs near the course of the A10. Roman coins (NHER 2419) were found in the parish before the 1930s and fragments of Roman pottery (NHER 30818) have also been found. 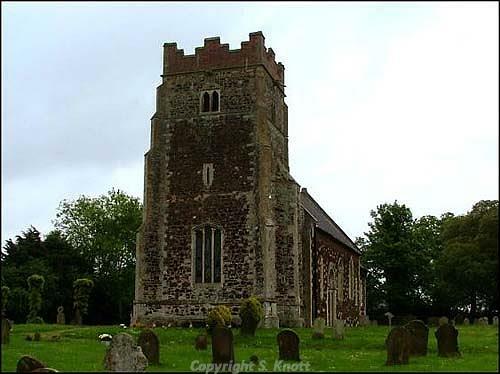 In 1086 Wimbotsham was held by William of Warenne, Hermer and the Abbey of Ramsey. The Abbey had the largest holding, and the Domesday Book records 13 smallholders, 2 ploughs, 4 pigs and 16 sheep. The only Saxon finds recovered from the parish are fragments of Late Saxon pottery (NHER 30810, 30818, 30819). The cropmarks of a possible settlement (NHER 35584), trackways and field boundaries of unknown date are visible on aerial photographs opposite St Mary’s Church. St Mary’s Church (NHER 2468) dates back to the 12th century. The south and north doors are both 12th century, and a medieval wall painting of St Christopher has been found in the nave. A few years ago a number of farthings were discovered by builders working on the porch. The coins are thought to have been left by local men leaving to fight in World War One, and the coins were reburied where they were found. Several human skeletons, probably dating to the medieval period, were found on a site adjacent to St Mary’s churchyard in the 1950s (NHER 2434). During the reign of Edward I the Abbot of Ely had a prison and a gallows (NHER 16985) at Wimbotsham. The site is unknown, but they are locally reputed to have been near St Mary’s Church. A medieval moat (NHER 11873) is visible as slight earthworks and as a cropmark on aerial photographs in the field immediately behind the primary school. A second medieval moat (NHER 11874) has been excavated in the fields off Stow Road. Detailed documentary research has established that this was the rectory of Wimbotsham. The excavation was carried out by the NAU in 1996, revealing that the rectory was established on the edge of a green in the 12th century, and the remains of a probable 13th to 14th century timber-framed building were revealed. The rectory began to decline in the 16th century, and had been replaced by pasture by 1740. Several high-status medieval finds have been recovered from the site, including a copper alloy skimmer, a ewer spout and a Caen stone mortar. The rectory is shown on an early 17th century map of Wimbotsham that is now in the Norfolk Record Office. 69 to 73 Church Road (NHER 31017) is a 17th century brick house that was divided into three cottages in the 18th century. Hill House (NHER 44021) on Lynn Road is an 18th century brick and carrstone house with a slate roof. Bryant’s map of 1826 shows a tower mill (NHER 16319) on Miller’s Lane. The mill was last used in 1900 and was demolished in 1913. Sarah Spooner (NLA), 8 May 2006.